Reproduzco con orgullo el mensaje de mi amigo Raúl que este mes presentará su segundo libro. Reservad la fecha porque seguro que tiene cosas muy interesantes que decir. Enlace a la información sobre el evento en la web de la librería Elkar. Os saludo para daros una noticia esperada largo tiempo. El 26 de noviembre presentaré mi segundo libro en Vitoria-Gasteiz. Su título: Euskal Diasporaren Ahotsa - Diálogos en Argentina y Uruguay (adjunto la invitación). En el libro que presento doy fe de lo sucedido en 2010 durante mi viaje por Argentina y Uruguay... por boca de los vasco argentinos y vasco uruguayos que tengo el placer de conocer. Poco después del Alto el Fuego de ETA, viajé al Cono Sur y, sin pensarlo demasiado, decidí que, a partir de aquellos diálogos podría surgir un libro. El sencillo acto tendrá lugar en la librería Elkar Megadenda de la calle San Prudencio, a las 19:00 horas: compartiré con vosotros algunas palabras sobre el libro y, si lo deseáis, podremos iniciar un breve coloquio o, sencillamente, pasar a saludaros y dedicar algunos ejemplares, si así lo deseáis. Elkar Megadenda cerrará a las 20:00 horas, pero quienes dispongáis de algo de tiempo podréis animaros a tomar un café o vino en algún bar de la calle San Prudencio. Os espero. ¡Gracias por vuestra atención y un cordial saludo, amigos y colegas! Aspaldian eman nahi nuen albiste on batekin natorkizu. Azaroaren 26an nire bigarren liburua aurkeztuko dut Vitoria-Gasteizen. Titulua Euskal Diasporaren Ahotsa - Diálogos en Argentina y Uruguay da. Artxiboan gonbidapena doa. 2010 urtean Argentina eta Uruguayerako egindako bidaiaren berri ematen dut aurkeztu beharreko liburuan... euskal argentinar eta euskal uruguaytarren hitzen bitartez. ETAk haren su etena iragarri ostean, hara bidaiatu nintzen eta, asko pentsatu gabe, erabaki izan nuen hor elkarrizketez osaturiko liburu bat zegoela. Ekitaldia San Prudentzio kalean dagoen Elkar Megadenda liburudendan izango da, arratsaldeko 19:00etan. Xumea izango da: hitz batzuk esango dizuet liburua berarik buruz eta, zuek nahi izanez gero, gainontzeko denbora aprobetxatuz, solasaldi bat izango dugu, edota aleen sinadura, nahiago baldin baduzue. Elkar Megadenda liburudenda 20:00etan itxiko duenez gero, denbora gehiago daukazuenok kafetxo edota ardo bat edango dugu inguruetan dagoen tabernaren batean. Zuen zain izango naiz. Ondo izan eta eskerrik asko zuen arretagatik, lagun eta adiskideok! 05/11/2013 04:46 basurde Enlace permanente. sin tema No hay comentarios. Comentar. - To try to read Lord Jim. - To quit not liking it. I may try to start it again in the future, because sometimes it ´s just not the right moment. ¨Into thin air¨ is divided in 21 chapters. At the beginning of each chapter the author extracts paragraphs from other books or quotes from other climbers, trying to give more sense to this challenge that is attempting to put your feet on the top of the highest mountain in the world. Funny that the one in chapter 15 is from the novel that I just quit. ¨There are many shades in the danger of adventures and gales, and it is only now and then that there appears on the face of facts a sinister violence of intention –that indefinable something which forces it upon the mind and the heart of a man, that this complication of accidents or these elemental furies are coming at him with a purpose of malice, with a strength beyond control, with an unbridled cruelty that means to tear out of him his hope and fear, the pain of this fatigue and the longing for rest: which means to smash, to destroy, to annihilate all he has seen, known, loved, enjoyed, or hated; all that is priceless and necessary –the sunshine, the memories, the future; which means to sweep the whole precious world utterly away from his sight by the simple and appalling act of taking his life¨. George Leigh Mallory, in a letter to his wife, June 28, 1921. ¨Not only during the ascent but also during the descent my will-power is dulled. The longer I climb the less important the goal seems to me, the more indifferent I become to myself. My attention has diminished, my memory is weakened. My mental fatigue is now greater than the bodily. It is so pleasant to sit doing nothing –and therefore so dangerous. Death through exhaustion is –like death through freezing- a pleasant one. ¨(O)ur wreck is certainly due to this sudden advent of severe weather, which does not seem to have any satisfactory cause. I do not think human beings ever came through such a month as we have come through, and we should have got through in spite of the weather but for the sickening of a second companion, Captain Oates, and a shortage of fuel in our depots for which I cannot account, and finally, but for the storm which has fallen on us within 11 miles of the depot at which we hoped to secure our final supplies. Surely misfortune could scarcely have exceeded this last blow… We took risks, we knew we took them; things have come out against us, and therefore we have no cause for complaint, but to bow to the will of Providence, determined still to do our best to the last…. Robert Falcon Scott, in ¨Message to the Public¨, penned just prior to his death in Antarctica on March 29, 1912, from Scott´s Last Expedition. ¨Everest was the embodiment of the physical forces of the world. Against it he had to pit the spirit of man. He could see the joy in the faces of his comrades if he succeeded. He could imagine the thrill his success would cause among all fellow-mountaineers; the credit it would bring to England; the interest all over the world; the name it would bring him; the enduring satisfaction to himself that he had made his life worthwhile…. Perhaps he never exactly formulated it, yet in his mind must have been present the idea of ¨all or nothing¨. Of the two alternatives, to turn back a third time, or to die, the latter was for Mallory probably the easier. The agony of the first would be more than he as a man, as a mountaineer, and as an artist, could endure¨. ¨I shall inevitably be asked for a word of mature judgement on the expedition of a kind that was impossible when we were all up close to it…. On the one hand, Amundsen going straight there, getting there first, and returning without the loss of a single man, and without having put any greater strain on himself and his men that was all in the day´s work of polar exploration. On the other hand, our expedition, running appaling risks, performing prodigies of superhuman endurance, achieving immortal renown, commemorated in august cathedral sermons and by public statues, yet reaching the Pole only to find our terrible journey superfluous, and leaving our best men dead on the ice. To ignore such a contrast would be ridiculous: to write a book without accounting for it a waste of time. ¨Men play at tragedy because they do not believe in the reality of the tragedy which is actually being staged in the civilized world¨. ¨When Jon Krakauer reached the summit of Mt. Everest in the early morning of May 10, 1996, he hadn´t slept in fifty-seven hours and was reeling from the brain-altering effects of oxygen depletion. As he turned to begin his long, dangerous descent from 29,028 feet, twenty other climbers were still pushing doggedly toward the top. No one had noticed that the sky had begun to fill with clouds. Six hours later and 3,000 feet lower, in 70-knot winds and blinding snow, Krakauer collapsed in his tent, freezing, hallucinating from exhaustion and hypoxia, but safe. The following morning he learned that six of his fellow climbers hadn´t made it back to their camp and were in desperate struggle for their lives. When the storm finally passed, five of them would be dead, and the sixth so horribly frostbitten that his right hand would have to be amputated. Into Thin Air is the definite account of the deadliest season in the history of Everest by the acclaimed journalist and author of the bestseller Into the Wild. On assignment from Outside magazine to report on the growing commercialization of the mountain, Krakauer, an accomplished climber, went to the Himalaya as a client of Rob Hall, the most respected high-altitude guide in the world. A rangy, thirty-five-year-old New Zealander, Hall had submitted Everest four times between 1990 and 1995 and led thirty-nine climbers to the top. Ascending the mountain in close proximity to Hall´s team was a guided expedition led by Scott Fischer, a forty-year-old American with legendary strength and drive who had climbed the peak without supplemental oxygen in 1994. But neither Hall nor Fischer survived the rogue storm that struck in May 1996. 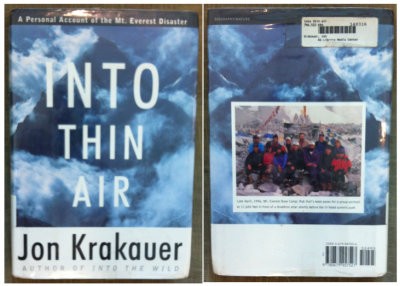 Krakauer examines what it is about Everest that has compelled so many people –including himself- to throw caution to the wind, ignore the concerned of loved one, and willingly subject themselves to such risk, hardship and expense. Written with emotional clarity and supported by his unimpeachable reporting, Krakauer´s eyewitness account of what happened on the roof of the world is a singular achievement¨. I enjoyed reading the book big time. I would have enjoyed it even more reading it in Spanish, but it is not translated in Spanish for Kindle. With the Spanish translation would have also come the conversion from feet into meters, which are continuously referenced, as it is logical. Long time ago I read also ¨Into the wild¨ by the same author and then I watched the movie. Based on ¨Into thin air¨ there is also a movie that is now in my to-watch list. ¨Through April and early May, Rob Hall had expressed his concern that one or more of the less competent teams might blunder into a bad jam, compelling our group to rescue them, thereby ruining our summit bid. Now, ironically, it was Hall´s expedition that was in grave trouble, and other teams were in the position of having to come to our aid. Without rancor, three such groups –Todd Burleson´s Alpine Ascents International expedition, David Breashears´s IMAX expedition, and Mal Duff´s commercial expedition –immediately postponed their own summit plans in order to assist the stricken climbers. The day before –Friday, May 10- while we in Hall´s and Fischer´s teams were climbing from Camp Four toward the top, the Alpine Ascents International expedition headed by Burleson and Pete Athans was arriving at Camp Three. On Saturday morning, as soon as they learned of the disaster that was unfolding above, Burleson and Athans left their clients at 24,000 feet in care of their third guide, Jim Williams, and rushed up to the South Col to help. Breashears, Ed Viesturs, and the rest of the IMAX team happened to be in Camp Two at that time; Breashears immediately suspended filming in order to direct all of this expedition´s resources toward the rescue effort. First, he relayed a message to me that some spare batteries were stashed in one of the IMAX tents on the Col; by midafternoon I´d found them, allowing Hall´s team to re-establish radio contact with the lower camps. Then Breashears offered his expedition´s supply of oxygen –fifty canisters that had been laboriously carried to 26,000 feet – to the ailing climbers and would-be rescuers on the Col. Even though this threatened to put his .5 million fil project in jeopardy, he made the crucial gas available without hesitation¨. This same expedition that the Spaniard Araceli Segarra was part of and that helped in the rescue the days after May 10, reached the summit of Everest about 10 days later. 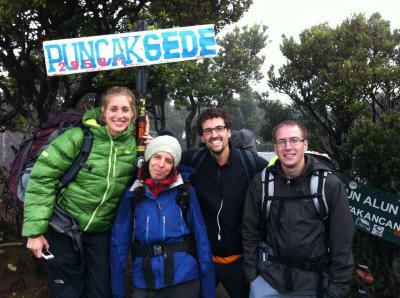 ¨On Wednesday, May 22, the IMAX team arrived on the South Col, in perfect weather, and set out for the top that night. Ed Viesturs, who had the starring role in the film, reached the summit at 11:00 Thursday morning, without using supplemental oxygen. Breashears arrived twenty minutes later, followed by Araceli Segarra, Robert Schauer, and Jamling Norgay Sherpa –the son of the first ascendant, Tenzing Norgay, and the ninth member of the Norgay clan to climb the peak. All told, sixteen climbers summited that day, including the Swede who´d ridden his bike to Nepal from Stockholm, Goran Kropp, and Ang Rita Sherpa, whose ascent marked his tenth visit to the top of Everest¨. Araceli Segarra is not only a very good looking woman and the first Spanish woman to climb Everest, but also a very talented person as you can see in her Website: http://aracelisegarra.com/ing/biografia.php Last October 15th she published her first book ¨Ni tan alto, ni tan difícil¨ -she has published books for children- that goes also to my to-read list. After finishing this book I started another one related to orangutans, called ¨Reflections on Eden¨ by Biruté Galdikas. 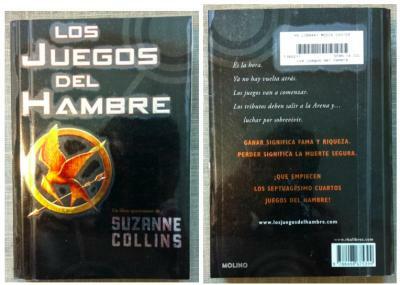 But I don´t like reading in English so I quit, to read in Spanish ¨The Hunger Games¨. 10/11/2013 12:31 basurde Enlace permanente. Libros No hay comentarios. Comentar. El pasado sábado me fui con un grupo de estudiantes de Jakarta International School (JIS) a un pueblito a unos 50 kilómetros al sur de Yakarta, cerca de Sentul, para trabajar en un proyecto de Habitat para la Humanidad. Esta organización se encarga de construir casas simples pero decentes para familias con menos recursos. Para reducir los costes solicitan la ayuda de voluntarios y ahí es cuando entran estudiantes y voluntarios de todas las partes del mundo. Esta ha sido mi tercera experiencia con Habitat, las anteriores fueron en Mongolia y en China. Para los futuros propietarios, porque se reduce el coste de la mano de obra y el trabajo se hace más rápido con mucha gente involucrada. Para los estudiantes de las escuelas internacionales, porque pueden salir de la ¨burbuja¨ y ver cómo es la situación real de mucha gente fuera de nuestro entorno. Aparte de colaborar como mano de obra, los estudiantes también organizan actividades para recaudar dinero para construir nuevas casas. Una casa como en la que estuvimos trabajando viene a costar unos 25 millones de rupias, que son unos 1.650 euros. Como veis el nivel de vida en Indonesia puede llegar a ser muy bajo. En el lugar al que fuimos se estaban construyendo unas 8 casas. Nuestro grupo, JIS, estuvimos trabajando en los cimientos de dos de ellas. Cavando zanjas y poniendo luego piedras para crear una base sólida. Otros grupos estuvieron trabajando en otras, en diferentes momentos de su construcción. Por ejemplo uno de los grupos estaba en la última fase, pintando las paredes exteriores y podéis ver qué bien quedan terminadas. También en las instantáneas podéis ver que en una de las fotos de grupo estamos posando con una familia local. Son los que habitarán las casas. Es otra de las cosas buenas de Habitat, siempre que vas a colaborar en un proyecto conoces a los futuros inquilinos y eso hace la experiencia más cercana. 11/11/2013 13:49 basurde Enlace permanente. Indonesia No hay comentarios. Comentar. El pasado domingo 10 de noviembre la página Web ¨Jakarta Expat¨ organizó una actividad llamada ¨Limpieza de Yakarta¨. Nuestra capital produce 6.000 toneladas de basura cada día y gran parte de ella acaba en las calles, luego en el río Ciliwung para terminar en nuestros océanos. Involucrando a la comunidad en una tarea de limpieza queremos extender el mensaje de que es el trabajo de todos mantener limpia esta ciudad, no solo la labor de los barrenderos. Queremos que la gente entienda lo perjudicial que la basura puede ser, y a la vez concienciar sobre la importancia del reciclaje. Nuestro objetivo es integrar este día con otras iniciativas de escuelas y grupos en la ciudad. La basura ese día será separada en bolsas de material reciclable y no reciclable, y las reciclables serán llevadas a ¨Proyecto Yakarta Verde¨ en el este de la ciudad. El ¨Proyecto Yakarta Verde¨ es un sistema de recogida de deshechos reciclables establecido por la fundación Niños de la Calle, ofreciendo una solución al problema de los residuos en Yakarta y beneficiando a la vez su trabajo de apoyo en el desarrollo de los niños de la calle para que se conviertan en jóvenes independientes, educados y capacitados. Invitamos al gobernador de la ciudad, Joko Widodo (Jokowi) a unirse a esta tarea de limpieza y así inspirar a sus seguidores a hacer lo mismo. Jokowi es considerado un modelo de comportamiento para muchos, y podría establecer una nueva tendencia anti-basura participando en esta actividad de ¨Limpieza de Yakarta¨ con nosotros. - Porque la ciudad produce más basura de la que puede manejar. - Porque queremos educar a la gente en la cultura de no ensuciar y lo perjudicial que la basura puede ser. - Porque queremos concienciar sobre el increíble y duro trabajo que realizan los empleados de la limpieza. - Porque queremos ser motores del cambio y hacer de este un día que el público recuerde, y se involucre cada día. - Porque es una manera de juntarse con amigos, familia y comunidad, haciendo algo que promueva un cambio positivo. En la página Web se puede ver que se habían organizado muchos sitios donde poder ir a colaborar con esta iniciativa. Yo fui al más cercano que era mi escuela. El club ¨Project Earth¨ (=Proyecto Tierra) de Jakarta International School respondió a la llamada y organizó a profesores, estudiantes, padres y gente involucrada con el colegio en la limpieza de una zona. Es verdad que existe en Indonesia en general un problema serio con la basura, un problema de cultura. Han sido ya muchos los casos en los que he visto a gente tirar basura delante de su propia casa. Y si hacen eso, ¿qué se puede esperar? Es un problema de cultura y eso con educación se cura. Espero que el gobierno tome cartas en el asunto y empiece a hacer algo ya, porque es una pena. 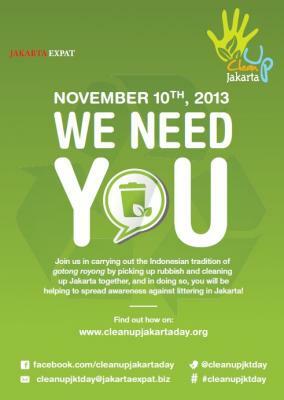 La campaña ¨Clean Up Jakarta¨ me pareció fantástica. Solo pondría un pero. A los participantes nos regalaron una camiseta. Si queremos ser ecológicos tenemos que poner en práctica las tres R-s: Reciclar, Reducir, Reusar. Más importante que reciclar en mi opinión es reducir el consumo. El montón de camisetas que se regalaron supuso un gasto de recursos innecesario, y más tratándose de una campaña de este tipo. 12/11/2013 13:46 basurde Enlace permanente. Indonesia No hay comentarios. Comentar. Quedamos a las 4:30 de la mañana en el McDonalds de Sarinah (Yakarta) y de ahí en autobús recorremos los 92 kilómetros (2h11´) que hay hasta una de las entradas al norte del Parque Natural Gede-Pangrango, en Cibodas. Cibodas está a 1.200 metros y la cima del monte Gede a 2.958 metros. Nos esperaban unos 1.700 metros de ascensión, más luego bajar por la cara sur a la pradera Suryakencana, a 2.080 metros, donde acamparíamos para pasar la noche. - Hot Spring – Cascadas de aguas termales. - Kandang Batu, que es un lugar de acampada. La visibilidad desde la cima era bastante reducida ya que estamos en la temporada de lluvias. Pero dentro de lo que cabe tuvimos suerte porque las previsiones meteorológicas apuntaban a que iba a caer la del pulpo, sin embargo tampoco nos mojamos mucho. Justo debajo de la cumbre tienes el cráter del volcán y sabes que andas cerca por el olor a azufre que hay en la última parte de la subida. Coronado el objetivo bajamos a la pradera Suryakencana, donde acamparíamos para pasar la noche. Al tran-tran subir a la cima nos llevó 6h30´ y bajar al campamento una hora más. Diana, desayuno y a empezar a bajar por la cara sur. Por el camino vimos una mofeta y bastantes sanguijuelas. Hay que tener cuidado para que estas sanguijuelas no se te peguen a la piel y te chupen la sangre. Simplemente porque no mola ver como van engordando a costa de tu sabia roja. Por lo demás no suponen ningún otro problema. Si se da la circunstancia de que pillas alguna, con sal o fuego puedes intentar quitarla, o sin mas esperas a que se de el festín con tu sangre para que se caiga sola. Un poco de picor y no pasa de ahí. Llegamos a la puerta sur del Parque Natural Gede-Pangrango, en Selabintana, después de caminar 4 horas. Comimos en el campamento Pondok Halimun y vuelta a Yakarta. Recorrer los 118 km. de vuelta nos llevó 5h30´, lo cual ya hace tiempo ha dejado de sorprenderme. 18/11/2013 14:34 basurde Enlace permanente. Indonesia No hay comentarios. Comentar. Un año más estoy participando en esta campaña, esta vez con colegas de la escuela en la que trabajo. podéis ver el extracto correspondiente, en el que diferentes profesores hablamos sobre Movember. Así fue Movember en años anteriores. 22/11/2013 15:55 basurde Enlace permanente. sin tema No hay comentarios. Comentar. Razón: Cuando pregunté a la clase quién podría resolver mi problema de matemáticas Katie se levantó y gritó a todo pulmón : ¨¡ME PRESENTO VOLUNTARIA COMO TRIBUTO!¨, perturbando al resto de la clase. 23/11/2013 02:55 basurde Enlace permanente. sin tema No hay comentarios. Comentar. ¨Podrías sobrevivir tú solo en la naturaleza salvaje rodeado de quienes quieren asegurarse de que no vives para ver el siguiente amanecer? Sus principios se pondrán a prueba con ¨Los juegos del hambre¨, espectáculo televisado que el Capitolio organiza para humillar a la población. Cada año, dos representantes de cada distrito serán obligados a subsistir en un medio hostil y a luchar a muerte entre ellos hasta que quede un solo superviviente. Cuando su hermana pequeña es elegida para participar, Katniss no duda en ocupar su lugar, decidida a demostrar con su actitud firme y decidida, que aún en las situaciones más desesperadas hay lugar para el amor y el respeto¨. Me gustó la novela, es una historia muy entretenida. Al devolver el libro vi que también está el segundo de la saga pero ahí me quedé, no me apetecía mucho continuar con la trilogía. - En EEUU hay bastantes problemas de disciplina que afortunadamente no suele haber en escuelas internacionales. Recuerdo los tiempos de Carolina del Sur, trabajando en escuelas públicas, cuando si algún alumno liaba alguna en clase tenías que enviarle a la oficina con un ¨referral¨, que es un informe diciendo que es lo que había hecho mal para darle el director el correspondiente castigo. 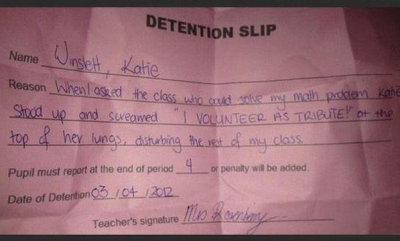 Reason: When I asked the class who could solve my math problema Katie stood up and screamed ¨I VOLUNTEER AS TRIBUTE!¨ at the top of her lungs, disturbing the rest of my class. Imagino que la profesora en ese momento no sabría de que iba el tema, porque si me pasa eso a mi en clase después de leer el libro estaría por el suelo desternillándome. - De los dos primeros libros hay película. No he visto ninguna de ellas pero la segunda se está proyectando justo ahora en los cines de Yakarta. Así que no descarto darme una vuelta este fin de semana por el centro comercial para verla. Los trailers tienen muy buena pinta. 23/11/2013 03:01 basurde Enlace permanente. Libros No hay comentarios. Comentar. 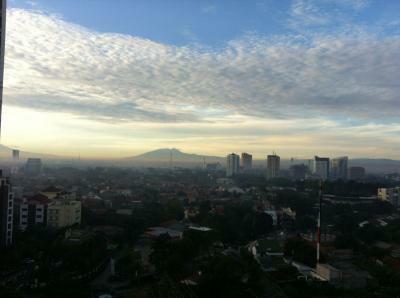 View from my apartment in Jakarta today. 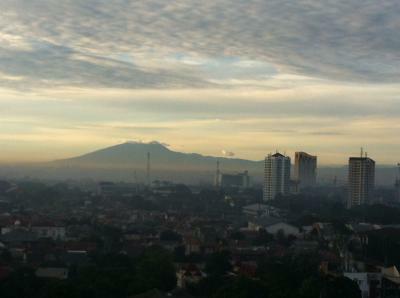 My guess is that it is Mount Salak (2.211 m.), about 70 km. south from here. This ¨little¨ thing made my morning. Big smile! 27/11/2013 03:16 basurde Enlace permanente. Indonesia No hay comentarios. Comentar. Vista desde mi apartamento en Yakarta hoy. ¡Increíble! Esta mañana me he levantado, he mirado por la ventana y he pensado ¨un momento, ¿eso son montañas?¨. ¡Y lo son! Llevo en mi apartamento casi 4 meses y es la primera vez que las veo, fantástica sorpresa. Creo que es el volcán Salak (2.211 m.) que está a unos 70 kilómetros al sur de aquí. Este ¨pequeño¨ detalle me ha hecho empezar el día con alegría. 27/11/2013 03:18 basurde Enlace permanente. Indonesia No hay comentarios. Comentar. El pasado 27 de octubre se celebró en Yakarta el primer maratón. Yo después de apuntarme a la media al final no fui porque me salió otro plan que me interesaba más, que era ir a pasar el fin de semana en Carita (Java) para ver el volcán Krakatoa (Sumatra). 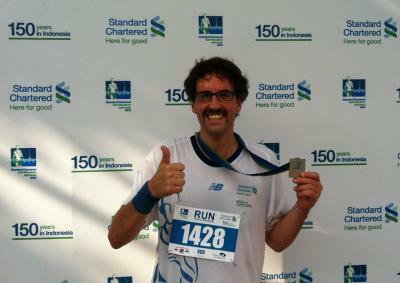 Un mes después sin embargo he tenido otra oportunidad de participar en una media maratón en Yakarta, organizada por el club Jakarta Free Spirit y patrocinada por el banco Standard Chartered. 1.- Las carreras son temprano para no asfixiarte luego con el sol. Esta media maratón empezó a las 05:30 a.m.
2.- Puedes salir a correr sin preocuparte de tener que dejar nada en ningún sitio, porque no vas a necesitar un jersey ni para antes ni para después de la carrera. Yo me metí en un taxi a las 04:00 a.m. con solo lo que iba a correr, más dinero y llaves. - Durante la carrera corrí bastante tiempo con un chaval que hizo la carrera descalzo. De hecho entramos en meta juntos, él unos segundos delante de mí. Cuando cruzó la línea se tiró al suelo y yo fui a felicitarle. Me quedé alucinado al ver que tenía ampollas reventadas en los pies. ¡Dos huevos como el caballo de Espartero para terminarla en esas condiciones y con el calor del asfalto a partir de las 7:00 a.m.! - En la primera parte de la carrera me pasaron a toda velocidad tres atletas negros, dos chicos y una chica. Era la cabeza de la carrera de 10 kilómetros. La chica sería la keniata Ann Njihia que ganó la carrera de 10K femenino en 35´47¨. Uno de los hombres sería el keniata Onesmus Muindi que ganó la categoría masculina en 34´56¨, el otro el keniata Samson que acabo en el mismo tiempo. Los tres coparon las tres primeras posiciones, entrando el cuarto atleta en 41´15¨. Ya veis, la chica hubiera sido pódium en la carrera de hombres. --- tengo mucho miedo a lesionarme los gemelos, que se me rompen cada dos por tres. - Mirando la clasificación me sorprendió ver que en categoría masculina terminé el 73 de 452, dentro del top 20%. Eso sería impensable en España, donde los populares tienen mucho nivel. Por curiosidad me metí a ver los resultados de la media maratón de San Sebastián el mismo día. En Donosti terminaron la media en categoría masculina 836 corredores y con mi tiempo hubiera quedado el 780. Quiere decir que hubiera entrado en el 7% … ¡por la cola! :-) Y eso sin contar que en Donosti la carrera principal era la maratón, donde estaban los machacas :-) ¿Mejor cabeza de ratón o cola de león? En el mundo popular compites contra ti mismo, así que da exactamente igual. Lo importante es estar a gusto con tu carrera y en mi caso con terminar ya me valía, en ese tiempo o en 20 minutos más como pasó en la media de Shanghái el año pasado. - Hablando de la maratón de Donosti, mi hermano Gebremariam la corrió una vez más (la hizo también en 2009 y 2011). ¡Era su decimocuarta maratón, qué se dice pronto! Terminó en 3h27´56¨, a 4´55¨/Km. ¡Palabras mayores! - El que ha explotado definitivamente y está en la liga de los mayores es Ramón Alvarez Otero, ¨Mon¨. En verano terminó su primer IronMan y este domingo corrió la Santurce-Bilbao, de 15.800 metros, en un tiempo neto de 1h02´04¨. Eso señores es un a ritmo de 03´55¨ cada uno de los 15 kilómetros, cuando la mayoría de los mortales no alcanzaríamos esa velocidad en los 100 metros lisos. ¡Enhorabuena IronMon! - En el dorsal de nuestra carrera se puede ver el lema ¨Run for a reason¨. La razón era recaudar fondos para una organización que se llama ¨Seeing is believing¨, que ha logrado recuperar la vista de cegueras evitables a unos 41 millones de personas en 25 países. 28/11/2013 00:03 basurde Enlace permanente. Indonesia Hay 2 comentarios.